Written and drawn by Jim Steranko. Colours: unbilled. Letters: Joe Rosen. Editor: Stan Lee. Softcover price: $12.95 USA / $20.75 CDN. Not quite a "new" release, but a collection of stories featuring Marvel's James Bond wanna-be is certainly an appropriate fit for us to review -- dontcha think? HOWEVER -- this review is based on an earlier two-issue reprint series, not the TPB which, according to some reviews, had problems in the colour reproduction dept. Just so's ya know! I often get the impression that Marvel Comics is a little more comfortable with its backlog of material than is DC Comics. Perhaps it's because DC keeps "reinventing" its line, making the editors recalcitrant to reprint older stories that aren't really in continuity. Or maybe I'm wrong, as DC does (occasionally) release collections of older stories. But Marvel seems to do it more. And a couple of Nick Fury collections, reprinting some 1960s stories, are a case in point. Nick Fury was (and is) Marvel's resident super spy. Created at the height of the pop spy phenomenon of the 1960s (which included James Bond movies and The Man from UNCLE TV series) Nick Fury was spun-off from Sgt. Fury and His Howling Commandos, only now with the WW II sergeant in modern times, middle aged, and head of the spy organization S.H.I.E.L.D. Originally written and drawn by Stan Lee and Jack Kirby, Fury was a regular feature in Strange Tales (sharing the comic with a Dr. Strange feature). Part way through this run, the creative reins were handed over to Jim Steranko, a new talent who was eager to shake up how comics were presented by incorporating pop art sensibilities and more eclectic panel arrangements. Steranko only stayed in comics for a few years, but his work became legendary. His Fury stories from Strange Tales were collected in the TPB Nick Fury, Agent of SHIELD and this thinner follow-up volume collects the four issues he did for Fury's subsequent solo comic (issues previously reprinted in a two-issue 1984 deluxe mini-series, Nick Fury, Agent of SHIELD). And some things are maybe best left to age gracefully in the imagination. Oh, I can well understand why Steranko made an impression at the time -- as a writer and artist he was quite fearless, willing to try anything. With his experimental panel arrangements, and stories that mined various eclectic sources for inspiration (from spy movies to King Kong) there's a lot of wild, untamed ambition at work. But it's ambition often untethered to discipline. A lot of the plotting is pretty loose and illogical, as Steranko will throw in wild ideas without bothering to integrate them properly. He tries to cram a lot into his pages, resulting in stories that seem abrupt and disjointed, sometimes relying on huge batches of text just to explain what's going on. Frankly, it's a bit amateurish. As an example, "Dark Moon Rise, Hell Hound Kill!" (#3) starts out a reasonably moody, if transparent, rip-off of The Hound of the Baskervilles...then crams in a completely ridiculous explanation (in what seems like an illustrated text page!) which comes out of nowhere and isn't foreshadowed in the least. The first time I read it, I half thought Steranko meant it as a parody of bad plotting...but I don't think so. One suspects Steranko needed to slow down, take a breath, and either focus his plots more, or stretch them out over more than one issue. It's as if he already knew he wouldn't stay in the comics biz for long and was trying to burn off all his ideas as quickly as possible. Likewise, his art style is intriguing and experimental...but exceeds his skill and even talent. Even at the time, John Buscema was better when it came simply to anatomy, to realism; Kirby was more dynamic. Steranko's perspective is a bit uncertain, and how and why panels and actions relate to each other can be vague. And it combines with his writing to seem a bit haphazard, as if Steranko would draw a scene he thought was cool...but not bother to figure out how the pictures would lead into the next sequence. There's a scene where two guys are chasing each other down a street, while Fury gets into a fight in an office building...and somehow the two groups get tangled up with each other, but it's a very confusing sequence. The title of this collection is derived from two of the stories, in which a villain named Scorpio first crops up, with no explanation, and escapes...and then a follow up story where Scorpio returns, but this time Fury seems to have figured out who he is -- but doesn't tell the reader, making it rather problematic. Steranko left after this, so even if he intended to reveal who it was, he never did. It fell to later writers to reveal Scorpio was Fury's estranged brother! I don't want to be too harsh on this. I'd heard about Steranko's Fury stories for years and wanted to read them, and there is certainly an interest factor, if only considered within the context of the times, and the more static and conservative storytelling of many then-contemporary comics. 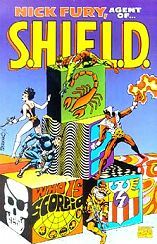 There is something fun and funky about Steranko's wild, psychedelic experiments, and an almost "adult" approach to the material (with Fury a bit of a hedonistic lady's man). But edgy presentation aside, even at the time there were better writers and artists, and read now, the entertainment appeal is more as a novelty than as gripping story telling.